Yesterday, I mixed up a batch of gingersnaps so that I could bring cookies to my friend Esther. Because my stove is new—we’ve had it for a week—I decided to test one cookie to get a sense of the baking time. In my old stove, eleven minutes would give me a good cookie. This stove seemed to run a little hotter, so I decided to try nine minutes. The results, dear readers, were not good—burnt on the bottom. 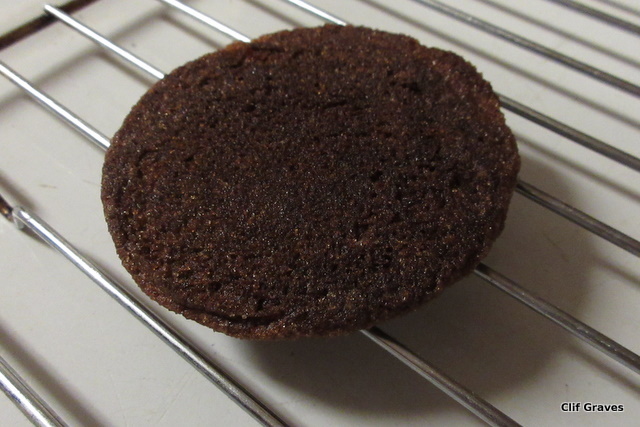 I tried eight minutes, again, with one cookie, and it was slightly burnt with a gooey middle. I turned the temperature down from 375° to 350°. No luck. I still had cookies that were burnt on the bottom and gooey in the middle. Next week is Thanksgiving, and I started thinking about what I would do if I were hosting the meal this year, and I didn’t have a reliable oven. As it turns out, I’m not hosting Thanksgiving dinner, but cooking nerd that I am, it gave me pleasure to come up with a solution anyway. Here is the plan I hit upon. I have two slow-cookers, and in them I would cook two five-pound chickens on top of potatoes and carrots. Gravy is always made ahead of time—I’ve got one batch in the freezer now, and by this Thursday I’ll have another batch made. Green bean casserole and sweet potato casserole could be heated in the microwave. I might take a chance on using the oven to keep the casseroles warm, turning the oven to a very low heat and setting the racks as high as they would go while still having room for casserole dishes. Stuffing would have to be made outside the bird, in a casserole dish heated the same as the other two. That leaves dessert. Fortunately, the top of the stove works just fine. I could make pudding for chocolate cream pies and use store-bought crumb crusts. So there! I could do it. It wouldn’t exactly be traditional, but it would be good enough given I didn’t have a reliable oven. I must admit that I miss my old stove. And Esther is going to be disappointed when I arrive without gingersnaps. Ah, well! At least I have a good story to tell her—the saga of the new stove. Shannon, I have faith that one way or another, Dave’s will sort it out. I made ginger snaps last week and thought of you. I got a kitchen aid countertop convection oven last spring. I have hardly used my big oven since. I love it. Carol, very interesting! Was the counter-top oven expensive? Not at all! Always open to suggestions. Thanks, Burni! On another topic…I dreamt last night that I used a time machine to come visit you, so that the trip wouldn’t be as long. I think I watch too many science-fiction shows 😉 Sure would be nice to see you, though. Oh, this is a sad story. You are grieving the loss of an old friend. But, your imaginative Thanksgiving Dinner is (not sure of the most fitting verb tense here) truly an impressive feat. The chef in you does not yield! Eliza, someone from Dave’s is coming tomorrow, so we’ll wait until then. However, I’m glad I made the pumpkin bread with our old stove 😉 Ironic, isn’t it? I was worried about the old stove failing before a holiday, and in fact the new one has failed. Onward and upward! You gotta watch your thoughts and the Law of Attraction! 😉 You’re a powerful creator, ya know! Derrick, it is indeed. But I expect that Dave’s will make things right.